Can you guys handle one more Christmas post? 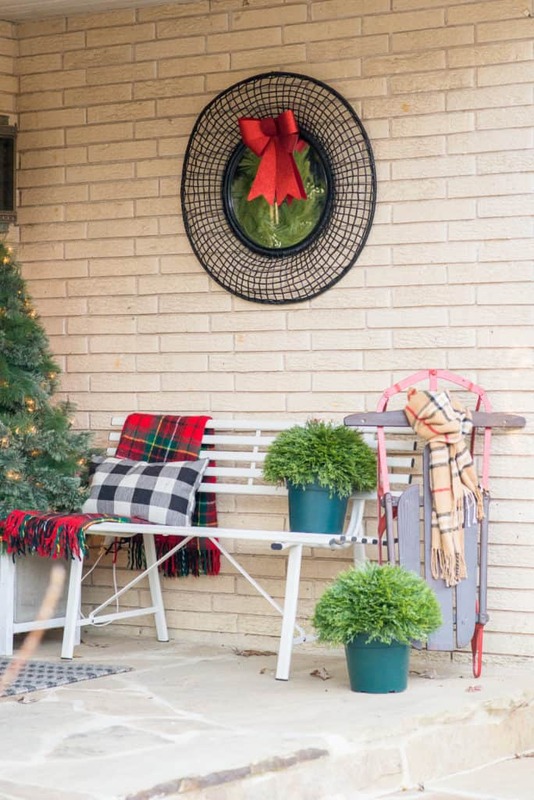 I’ve decorated my front porch for Christmas ever since we moved in here; but this is, by FAR, my favorite look yet. The funny thing is that almost everything is the same as last year EXCEPT that earlier this year, we had brand new doors put in. The doors drastically change the look of the space and I just adore it. 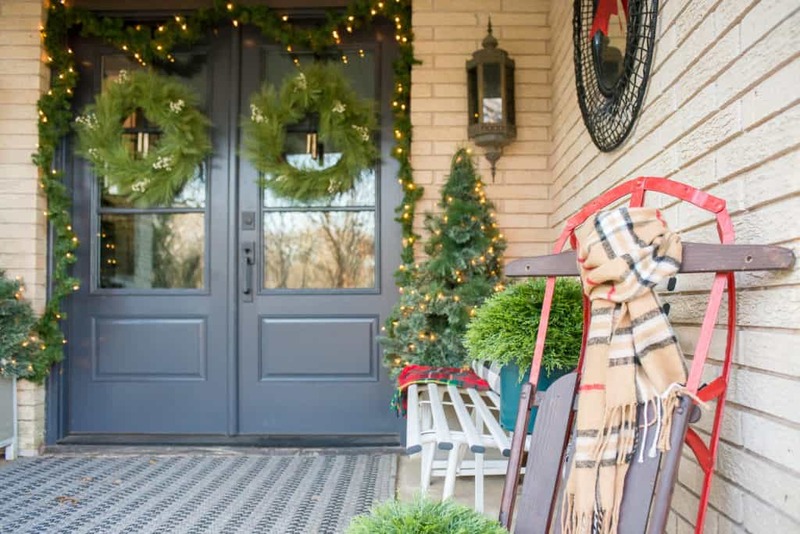 I won’t keep you hanging… I’ll make sure to give you a good before/after and hopefully some Front Porch Christmas Decorating Ideas! 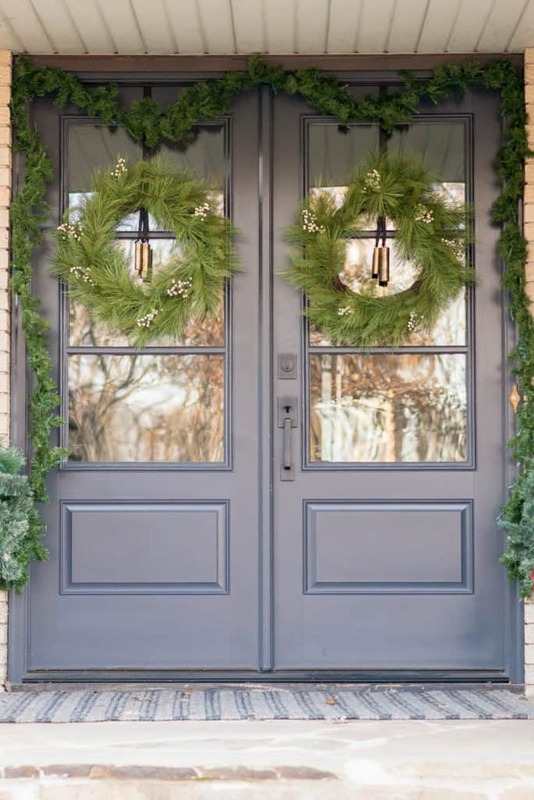 Gosh, I love those doors (you can read about purchasing custom doors or enlarging your glass front doors if you are interested). 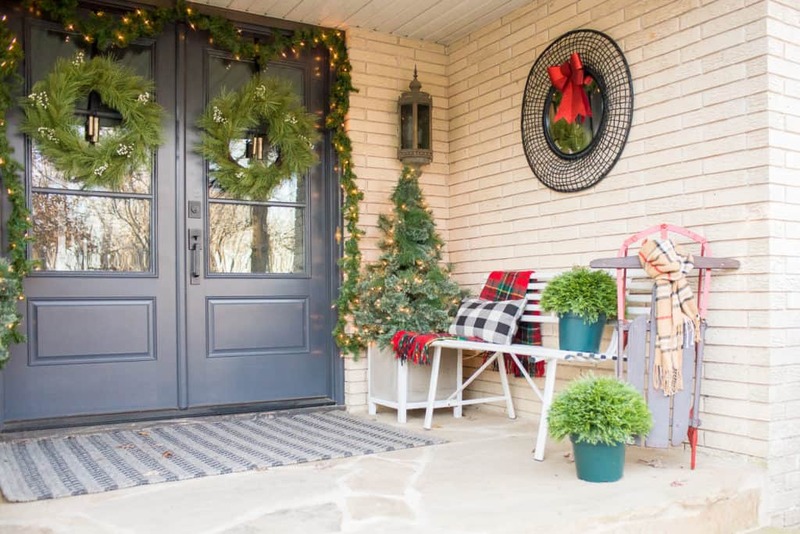 Before we get too far into this post, let me show you what our Christmas front porch looked like last time I shared it. 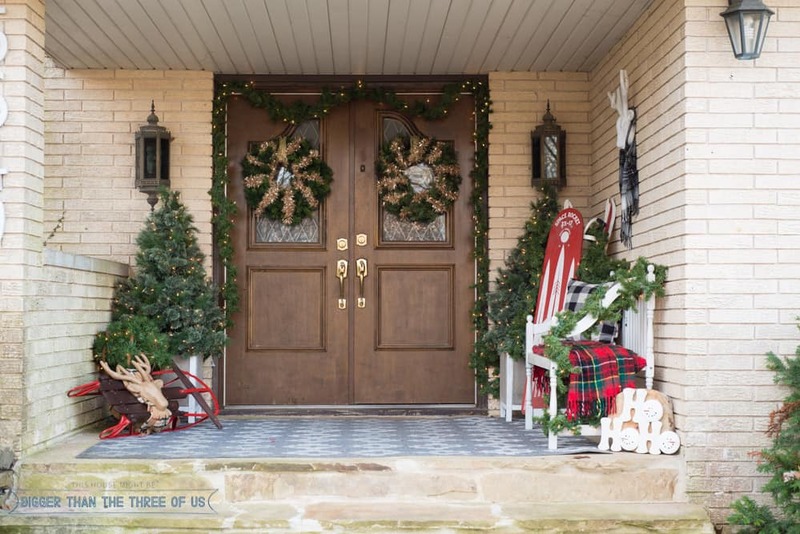 Read all about the traditional front porch Christmas decor here if you are interested. 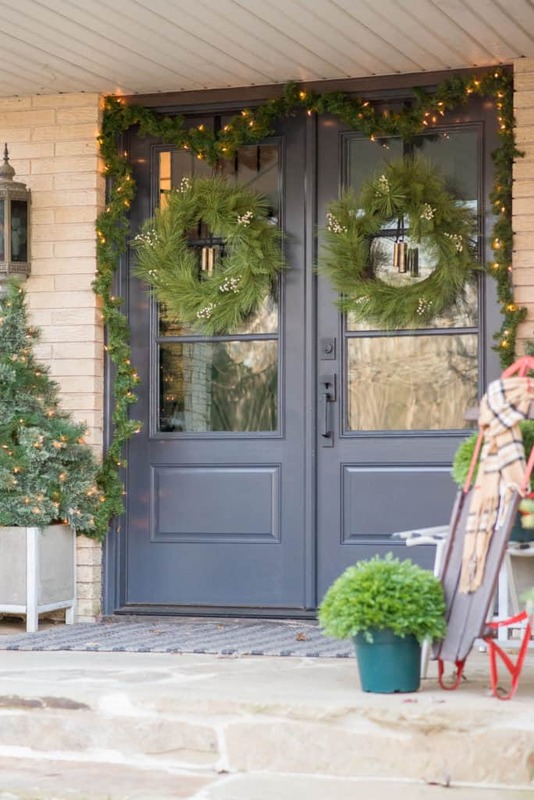 I couldn’t find last year’s front porch, but when you compare this year’s and 2015’s, you see lots of the same with a few tweaks. We updated our bench (but it’s still white) and we also updated our rug (although it’s still gray). Other than that, it’s just small decor changes. But, they made a big difference, don’t you think? I’ve had the same wreaths since we got married, so this year, I bought two new wreaths from Target. I love the added bells in the middle. Everything else came from our Christmas boxes or, like the fake greenery (which I still love), was purchased earlier this year. Affiliate links below. Thanks for supporting this blog. I would have loved to find a vessel for the two fake plants but I didn’t have anything that worked. Maybe by next year, I’ll come up with something that fits well. How about a few pictures with the lights on? They are just my favorite. I hope you liked the Front Porch tour. 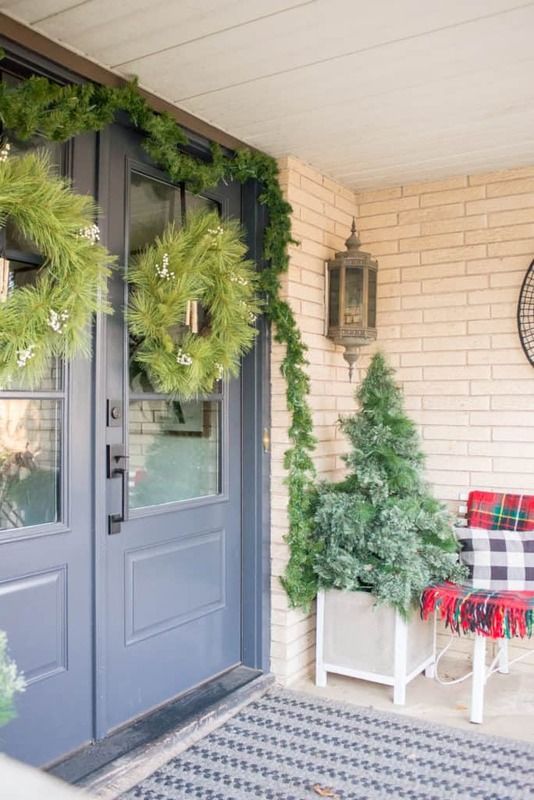 If you missed my Christmas tours from last week, I shared my non-traditional Christmas mantle and did a mini-Christmas Home Tour. Pop over and read about those if they interest you.